In the latest news on the popular instant messaging platform WhatsApp, the Facebook-owned company has announced that it is enabling end-to-end encryption for all of its 1 billion users on the latest version of the application, effective today. This means that any type of message sent on WhatsApp in any form – be it text, voice, image, video, documents or calls – will only be accessible to the recipient with no other party, including the WhatsApp team, having access to it. End-to-end encryption secures all messages with a digital lock, and only the sender and recipient have the special key needed to unlock and read the message. Each message sent will have a unique lock and key which ie enabled automatically. Users do not have to do anything to access end-to-end encryption – as long as they have the latest version of WhatsApp, it will be enabled. 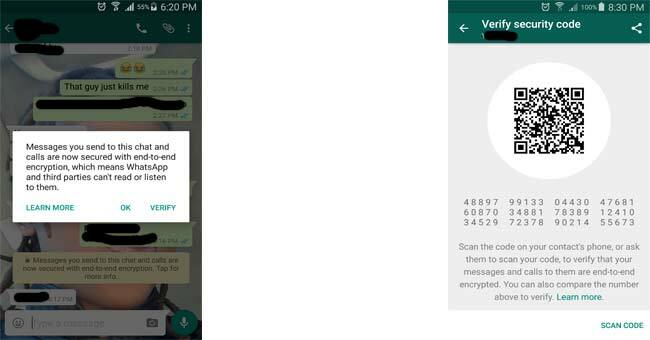 WhatsApp has also stated that this encryption cannot be turned off at any point. The change has been accompanied by a notification that users on the latest version have already seen coming up when sending or receiving a message from another user with the latest version of WhatsApp. The end to end encryption also extends to Group messages, and just like other new features from WhatsApp, it only extends to the entire group when all members have updated to the latest version. In a blog post published by WhatsApp to announce this change, the team highlighted the significance of this technological shift in limiting information access to only the intended users. No one can see inside that message. Not cybercriminals. Not hackers. Not oppressive regimes. Not even us. End-to-end encryption helps make communication via WhatsApp private – sort of like a face-to-face conversation. The rest of WhatsApp’s statement also touched on the much-debated issue of law enforcement compelling private companies to hand over privately held user data. This has been stirred up by the controversies around the United States’ FBI seeking Apple’s help in breaking into a phone to retrieve data. Recently there has been a lot of discussion about encrypted services and the work of law enforcement. While we recognize the important work of law enforcement in keeping people safe, efforts to weaken encryption risk exposing people’s information to abuse from cybercriminals, hackers, and rogue states. Even though it’s focusing on encryption WhatsApp’s message is very clear. It wants to protect users’ privacy in every way possible, and the move to end-to-end encryption has managed to that for 1 billion people. Soon its going to be banned by our government that’s why the refuse BBM over the same issue ! This is different, on the case of BBM, l supported the move by our government. Blackberry had access to the servers as well as the encryption keys. They also cherry picked who they gave access to the platform or not. They gave NSA, MI6, Canadian and Mossad unlimited access to the platform and denying everyone else. That didnt go very well with a lot of gvts worldwide. This is all good news as long as Facebook can clean its dirty hands from the PRISM program!! Iwe ukanyatsorohwa pasi petsoka unovhura wega whether ibiometric kana password yacho.